You are visiting the Return Policy of ac-adapter.ca. Contact our service, tell us what's happened and show some pictures as proof. Get an RMA (return number) and return address. Take one picture of the return package and one picture of the return invoice. Return item back and email this 2 pictures to our service, get refund in 1 min. Get an RMA (return number), the return address and a replace order id. Our service will update the status of resend order, warehouse will send a new item out. Just wait for some days, you will recieve a new item. Returns within 30 days from receipt of order can be returned for exchange, refund or credit at ac-adapter.ca's discretion. Please be aware that specific manufacturers have more restrictive return policies. All products returned must be 100% complete, contain all original boxes and packing materials, have original UPC codes on the products, contain all manuals, blank warranty cards and other accessories and documentation provided by the manufacturer. If any of the above is not returned with the item, you may be subject to a repackaging fee, which will be determined on a case by case basis. 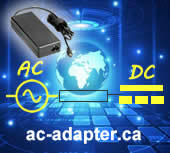 ac-adapter.ca accepts returns on merchandise from select manufacturers within 30 days from receipt of order. Original shipping charges are not refunded on returned items unless there was an error on our part. Please note: if you were eligible for free shipping on your order, and are returning for a refund, then the actual cost for shipping may be deducted from your refund. Customer is responsible for shipping charges on returned items. All shipping cost for returned merchandise will be paid for by the shipper. No C.O.D. on shipments will be accepted. Only shipping cost for incorrect items delivered to the customer will be paid for. We will not refund the extra shipping cost of express delivery. We will only refund shipping cost if the item is returned by First Class Mail, US Priority Mail or UPS Ground Shipping. If items are returned by express delivery, refund will only cover up to 6.00 pounds..
ac-adapter.ca strongly recommends you fully insure your return shipment in case it is lost or damaged and to use a carrier that can provide you with proof of delivery for your protection. DEFECTIVE returns can be returned directly to ac-adapter.ca within 30 days receipt, at ac-adapter.ca's discretion for: credit, replacement, exchange or repair. NON-DEFECTIVE returns can be accepted directly by ac-adapter.ca within 30 days from receipt, at ac-adapter.ca's discretion for credit or exchange. All NON-DEFECTIVE returns for refund are subject to a 15 percent restocking fee. DAMAGED ITEMS If merchandise arrives damaged: save the merchandise and the original box and packing it arrived in, notify ac-adapter.ca immediately to arrange for a carrier inspection and a pick up of damaged merchandise.